I've start learning java two month ago and this is my first script with 90% of my contribution, so don't expect too much. - hide selected and so on. Hope the interface are self explained. 1. Conflict with Utility2Plugin; can't coexist so chose one. 2. I've don't know (yet) how to implement correctly the UNDO-REDO action. 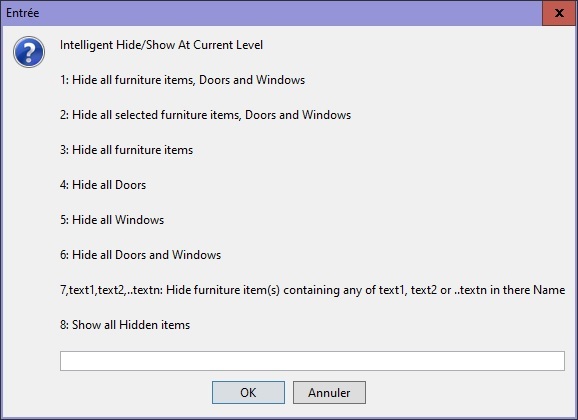 In this version, undo (only for hide/show section) work acceptable BUT redo didn't! 3. That's being said I recommend to test on an test-file or backup. It's great that your plug-in provides some missing selection features and I've been wondering myself for a while how adding some Select all walls, Select all rooms, etc menu items could be useful. About searching furniture by name, it coud be nice to look for the furniture inside groups and subgroups. If programming a recursive method is too complicated, you could also use the getAllFurniture method in HomeFurnitureGroup class. 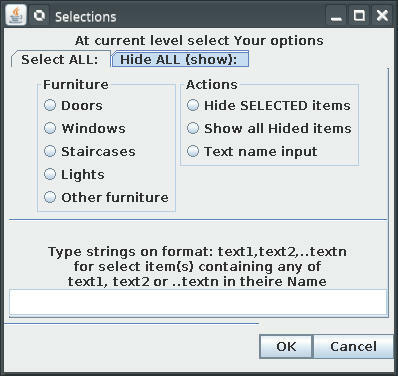 About searching windows, it looks like you search them from their name, but then it will work only if the furniture name contains "window" word, making this option misleading compared to the Doors option which selects all doors and windows. For someone who just start to learn java is a honor! But "retourner à nos moutons". In my mind was to kip the sweethome3d as simple as possible; I don't want to pollute the menu more than necessary. 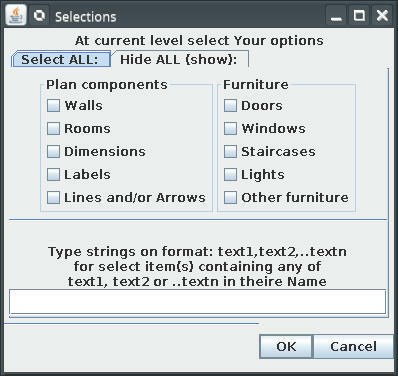 I get inspiration from LibreOffice where is Paste special... entry and than a lot of option (only for those who want). When you have all the plugins installed and have more than 12~15 entry in one menu it's like you need to read Shakespeare again and again. I don't think so. For the standard program You have already implement the basic option. Who need more could install plugins. Indeed, me or someone else will try to improve it. My fault is I don't make fully tests and this (and maybe others) I missed it. For me everything is complicated and if is not, I made it to be. Anyway is not the single problem; I have to implement internationalization, the redo action etc. Is true, but I don't find a specific criteria to make difference between door, window or service hatch wile all are the same and I don't want to select/hide all. The same situation are for staircase and for lamps. A stair without cutOutShape or a lamp without light are like all other furniture and I don't find a bather way to identify them. 6. (and the last) This plugin and the next few are part of my learning java curve. Now I've start a fight whit another useless plugin which don't want to work as I want. As usual I've made the final (graphic interface) but I don't manage yet to make it functional. More, with this version, option 5 doesn't work.